I recently wrote regarding a proposal for improving practice squad and training features by hiding player ratings until the player has played enough games to reveal them. Of course, there's still a lot of other aspects of the game that I'd like to see improved. I was pleased that this year's Madden 17 implemented some items from my wishlist from last year. There's still a lot from last year's wishlist that I'd like to see implemented in some fashion. Playing Madden 17 has also raised new ideas for improvement. Loose ball A.I. was a point on my wishlist last year, but it wasn't addressed, as evidenced by this clip. Now, admittedly, a lot of the following suggestions are going to be based on my own subjective experiences with the game. And these opinions come from someone who is almost exclusively a single-user Franchise player. My priorities are going to be far different from the desires of MUT players or even online franchise players. 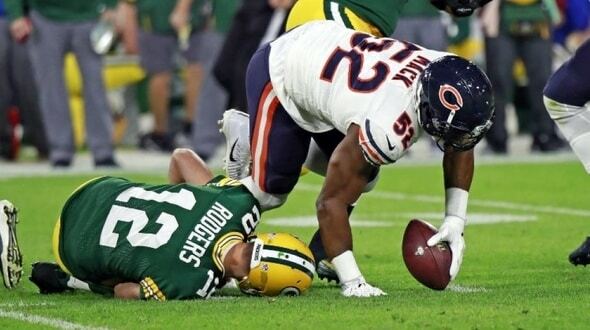 I'm also not going to bother (right now) with the obvious problems: rubberband AI that creates obnoxiously artificial "momentum swings", the broken man coverage, robo QBs, the complete unwillingness of my linemen to block at the point of attack on run plays, or the down-tuning of new features (such as throw out of sack, aggressive catch, and defensive line moves) to the point of irrelevance, and so on. Instead, I'm going to try to focus on less-obvious mechanics that interact with these problems and which have forced EA to make the [bad] decisions that they've made. The general design of Madden isn't very run-friendly. The fact that the game is balanced and tuned for quick, 6-minute quarter, pick-up-and-play online matches (instead of full 15-minute quarter games) means that grinding it out on the ground to establish the run is futile. Trying to run the ball in a 6-minute quarter game (with accelerated clock turned ON, which is the default) can rapidly burn through time. I regularly eat up an entire quarter and a half in a single drive when I commit to the running game in such matches, and that is just unrealistic. This forces both players and the CPU to depend on the passing game to score before a half expires. In my opinion, this is a fundamental design flaw of Madden, and the game will never be truly great as long as 6-minute quarters is the focus of design. Madden's fundamental design is not very run-friendly. But fundamental design flaws aside, my experience with Madden 16 and 17 has been that the CPU is completely inept at running the ball. Even when the blocking is solid, the CPU-controlled back can rarely identify and hit the hole, and usually runs right into a waiting defender or one of his own blockers. CPU backs are even worse at running to the outside, as they'll often run backwards in a futile attempt to get to the edge, instead of just cutting upfield for whatever yardage they can get. This often leads to large losses of yardage, backs up the CPU, and contributes towards the CPU's over-reliance on passing the ball. I usually play with the CPU Run Blocking A.I. 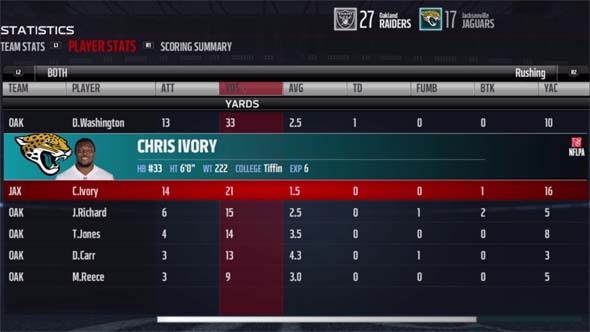 slider up between 80 or 100, and yet CPU running backs still routinely finish games with stats along the lines of 15 rushes for 20 total yards. Pathetic. If a CPU runner does have a successful game, it's usually because they broke one or two long runs due to a missed tackle, and 90% of their yardage total comes from one or two plays. Also pathetic. Seriously, I have rage-quit an hour into games because of the CPU's ineptitude. 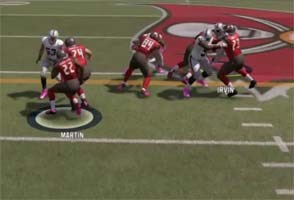 CPU Doug Martin runs right into his pulling guard [LEFT] instead of going inside like the trap play is designed. 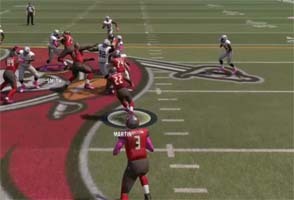 CPU Doug Martin has a huge hole with only a single cornerback to beat [RIGHT], but cuts into traffic instead.